Featuring the winner of our inaugural Concerto Competition for wind musicians, which will be offered every two years. 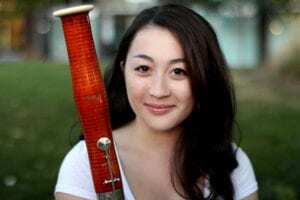 Winner Midori Samson is a bassoonist, educator, and activist. Currently, she is a Collins Fellow at UW-Madison, and holds the positions of second bassoon in the Wisconsin Chamber Orchestra and principal bassoon in the Beloit-Janesville Symphony. Previously, she was a Fellow in the Civic Orchestra of Chicago and performed in several Chicago Symphony Orchestra family concerts. In addition, she has performed with the Austin, Charleston, and New World Symphonies, the National Orchestral Institute, the New York String Orchestra, and the Pacific Music Festival. Her chamber music appearances include the Norfolk and Bowdoin International music festivals, Banff Centre, and Elliott Carter’s 102nd birthday party. As a soloist, she most recently performed a recital of seven new solo works for bassoon, which she commissioned from composers from across Africa. Midori will perform the Concerto for Bassoon by Frigyes Hidas with the UW-Madison Wind Ensemble. Midori has presented master classes at Wright State University, the University of Santo Tomas, and the Philippine High School for the Arts. Deeply passionate about community engagement, she has volunteered as a teaching artist in Austin, Guatemala, New Orleans, New York, and the Philippines, and continues to visit rural India annually to facilitate interdisciplinary arts workshops with Artists Striving to End Poverty. She is a founder of Trade Winds Ensemble, which continues to host composition workshops for children in Haiti, Kenya, Tanzania, and at a refugee center in Chicago. She was awarded the Joseph W. Polisi “Artist as Citizen” Prize, and the McGraw-Hill Foundation Award for Music Education and Community Outreach for this work. Most recently, she was invited by Yo-Yo Ma to be on the faculty of the Youth Music Culture Guangdong Festival, where she will teach and perform alongside him this winter in Guangzhou, China. Midori holds degrees from The Juilliard School and the University of Texas at Austin. Currently, she is pursuing a doctor of musical arts degree with Prof. Marc Vallon at UW-Madison, with a secondary focus in social work. In her free time, she takes care of her rabbit, Fang, and is cooking a meal from every country of the world, week-by-week.